Amina was able to escape from family and take shelter in a safe place! She contacted us and confessed terrible and painful story of her kidnapping and of her home arrest against her will. Video conversation with Amina will be published within a few hours. 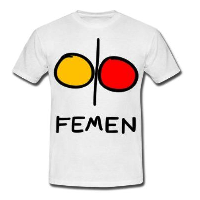 FEMEN greets all with small victory. FREE AMINA! This entry was posted in English, France, Tunisia, Ukraine and tagged amina on April 15, 2013 by Larysa.